If you've been a Sketchup user for any length of time at all, you'll know that you NEED to have a mouse with a wheel to navigate a Sketchup model. Check out this older, but completely relevant video that Google has done on the subject. When I am out on the road, I always have my MacBook Pro with me. I use this for modeling in Sketchup on the go. I always bring with me a three button mouse. This can sometimes be a pain if I am in a place where there isn't adequate room for a mouse. Sometimes I simply forget the mouse. Its really time consuming to model without it though. With the wheel mouse you can orbit, pan, and zoom while you are in the middle of a drawing operation. This is essential to fast modeling. 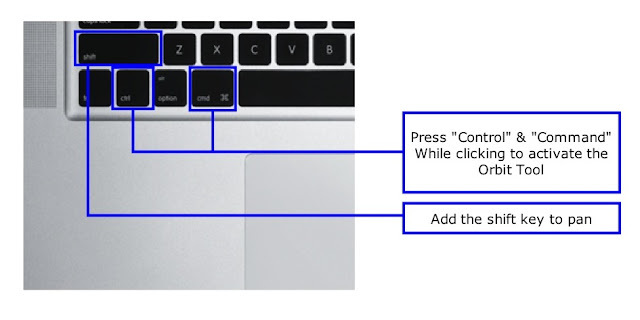 If you don't have a wheel mouse, you have to stop every time you want to orbit, pan or zoom and click a command from the toolbar if you are using the trackpad. Well just the other day I discovered that there is a better, multitouch way. Its not as slick as this types of gestures you'd find on an iPad, but it certainly makes modeling faster. Check out this video I did demonstrating the process. Note that this method works only for MacBooks. I am so happy I discovered this method. Try it out for yourself, you can pretend that you are ">Tom Cruise from "Minority Report"